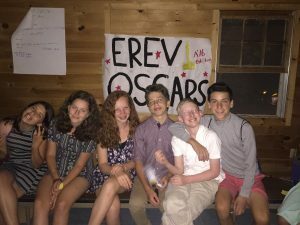 Maccabiah has finally broken out at Machaneh Yavneh! Over the past few days, rumors began to circulate that Debbie had been offered a job at Camp Tel Noar. In the חדר אוכל (dining hall) a video played from Efraim Yudowitz, the current director of Tel Noar and a previous camper at Yavneh, telling Debbie about an offer they’d discussed. A series of leaked emails were found in the צריפים (bunks) between Debbie and Efraim, discussing the same offer and a series of phone calls they had. In the meantime, Arayot had an afternoon פעולה (activity) where they wrote and fil med miniature scenes. Then, at night, we had a פעולת ערב (night activity) called Arayot at the Oscars. The חניכים walked down a red carpet while they were photographed by the מדריכים (counselors) who were dressed as paparazzi. Then, we premiered all of the scenes they’d filmed and had a ballot where everyone voted on best film, best actor, and best actress. Yesterday, Efraim Yudowitz visited camp in the morning, and the חניכים had to decide who they wanted as the next ראש מחנה (head of camp). Davida, ראש בנות (head of girls area), and Meir, the ראש בלים (head of boys area), were briefly considered, but eventually the camp landed on the גורים מריך (counselor) Mitch Breslau. Mitch was quickly kidnapped by the Roshes who wanted Debbie to stay as ראש מחנה but later in the day, escaped while everyone was in the בית עם (gymnasium). Right before he entered, a limousine came to take Debbie away to Tel Noar, and then, finally Mitch announced the beginning of Maccabiah as his first decree. The חניכים were all very excited to find out if they were on team עץ (Tree) or שורש (Root) and are looking forward to the rest of Maccabiah!